I have 7000 waves. Would it be more profitable to run custom full node or to lease those waves? I think leasing is more profitable since running will cost you either hiring a vps or running it at home on a pc + the time you need for maintenance. And with that amount you will not forge many blocks. You could run your node and apply for the Community Nodes program, it will get more profitable if Waves leases to your node. However leasing to a node costs you nothing (nor time, nor money). Own node on 7000 Waves + Community Nodes Program can be more valuable or equal to best leasing proposals. 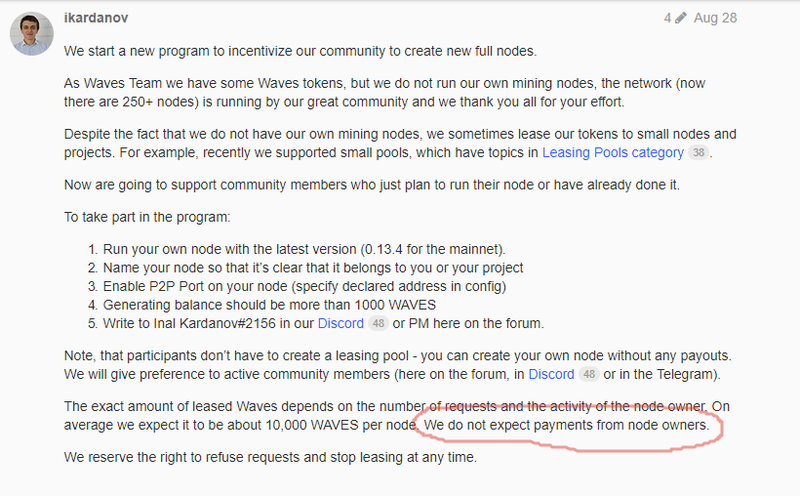 And if you apply for the Community Node Program, do you need to pay fees for the waves they will lease to you node or you can keep all the earnings? That sounds nice. Does the speed of the internet depends if you want to have better chance to mine a block? Or it is only about amount of waves you have? Not depends on the speed, but should be enough to communicate with other nodes. So what is the most simple way to run a node? Will I need to enter somewhere my private key for full node in the process? Or I can just create new wallet with ledger and use only public key? As I know, private key don’t use for sharing on waves node. Only encoded seed when you starting the node.